A few clouds. Low 43F. Winds S at 5 to 10 mph..
A few clouds. Low 43F. Winds S at 5 to 10 mph. Narrow private streets with no separate, protected sidewalk will run past rowhouses in the Exchange in Antelope Valley. Instead of a sidewalk, a pedestrian walkway will be marked by a different color of concrete or different paving material within streets. The design, developers say, will allow for more green space. The area around the former Williamson Honda dealership has been cleared to make way for rowhouses and a multi-use building planned as part of the Exchange at Antelope Valley. Rowhouses planned for the Exchange at Antelope Valley include rooftop decks that developers say will provide great outdoor living space. 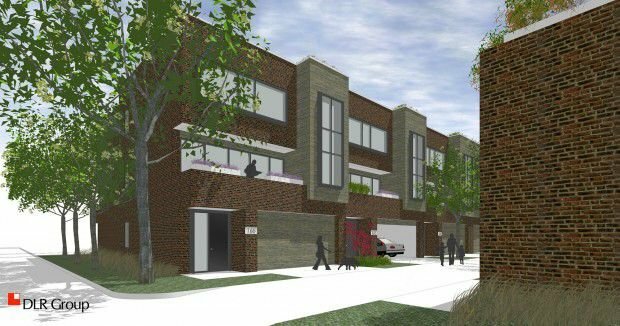 The first of the rowhouses near 21st and N streets could be ready by November. Plans for the Exchange at Antelope Valley include a mixed-use building that would include about 30 large studio apartments along with first-floor retail, possibly a restaurant. After plans for The Exchange, a row-house development, fell through, the city is again asking for development proposals for an area near 21st and N streets. 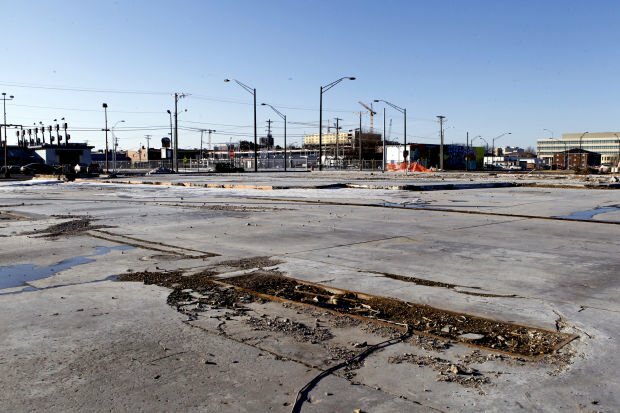 In coming months, development will bring drastic change to the area of 21st and N streets. The Exchange at Antelope Valley, named after the historic telephone company buildings nearby, will bring 150 to 180 residents closer to downtown. The $27.6 million project, made attractive to developers because of the recent Antelope Valley revitalization, is unique in its large size. Fred Hoppe, the developer with Hoppe Brothers, said he thinks it will change the face of east downtown. The rowhouses planned are the first of their kind in Lincoln, he said. “There isn’t going to be that suburbia feel with this development,” Hoppe said, “but you will have those nice amenities of suburbia. “While you don’t have a yard, we have rooftop decks that will make for great outdoor living spaces and the trail to Union Plaza will be great for walks on summer nights. It’s going to have a very distinct and unique atmosphere." The project calls for 63 rowhouses to be marketed to millennial professionals. Another multi-use building will house a restaurant, coffee shop, salon and fitness center on the first floor with 30 large studio apartments above. Construction begins this spring with completion by summer 2015. A grocery store, at Antelope Valley Parkway and K Street, is still in the plans and should be completed by the end of July 2015 with a $7.5 million construction cost. Hoppe said he is confident those plans will come together, and the grocery store will become a hot spot for downtown commuters he expects will shop before and after work. It will also be a welcome addition for new residents to the area and other Near South neighbors, he said. The rowhouses will be phased in based on owner interest. But at least six units are to be substantially completed by Nov. 1. All units, which should appeal to singles or two people living together, are to be finished by no later than 2018, according to an agreement with the city. The influx of residents could mean even more redevelopment in the area. Dave Landis, the city’s Urban Development Director, said he thinks the influx of residents will positively affect the nearby neighborhood. It’s this kind of infill and building up, not out, that Landis likes to see. “You want people to use your downtown areas more than from 8 to 5,” he said. “Downtowns that have people leave at 5 lack vitality and investment. It’s happened at places like the Larson Building and other new student housing projects in the works at 18th and Q streets and near the Gold’s building at 10th and N streets. Like the Exchange at Antelope Valley, the Fallbrook development off U.S. 34 was a master-planned community, and it took density to attract businesses, says Phil Wenta of NEBCO. Northwest Lincoln’s growth has driven more commercial opportunity, and the area is still growing, he said. Wenta said he’s seen a “halo effect” of more growth not only in Fallbrook but all of north Lincoln because of the 5- to 7-minute drive and easy access to the booming West Haymarket and downtown. Landis, the Urban Development Director, said he hopes to see similar growth happen on the east edge of downtown. But it’s more of a challenge to grow in a contained area. “It’s easier to do that at the edge of the city, but it’s extremely rare to see it being done in a contiguous 5 to 7 acres in east downtown,” Landis said. Roger Pletcher remembered the way Havelock used to look. New businesses, new developments and signs of growth are popping up across the city. Recent improvements in the area include new streets and storefronts.